GRAFENWOEHR, Germany (Nov. 01, 2008) -- Soldiers don't always have to carry a weapon, crawl into an M-1126 Stryker ICV, don their interceptor body armor, or even break a sweat to train. "At the Joint Multinational Training Command, a suite of fully exportable training tools - live, virtual and constructive, are available for Soldiers and coalition partners to use for training on tactical systems they may need to use downrange," said Lt. Col. J.D. Koch, director of operations at the Joint Multinational Simulations Center. "Instead of sending our Soldiers to the States for sustainment training on critical Army Battle Command Systems, the units can relocate their Soldiers to a location of their choice, bring their computers or use ours, and get the training they need more cost effectively." Soldiers learn to use Force XXI Battle Command for Brigade and Below, also known as FBCB2, while attending Digital University. Learning the system in a classroom means they don't have to spend valuable time learning it in theater. 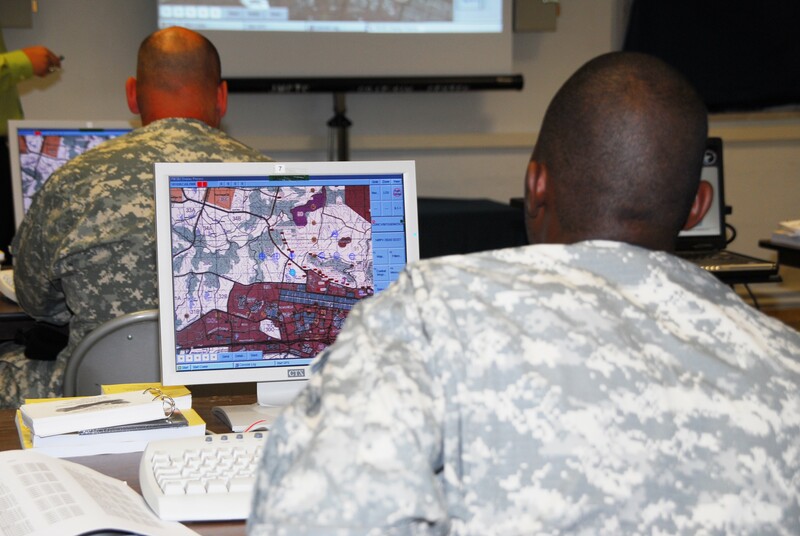 Since Digital University's inception in July 2007, nearly 3,000 Soldiers have been trained on any number of tactical systems, including the Advanced Field Artillery Tactical Data System, the Maneuver Control System, the Command Post of the Future, the Distributed Common Ground System-Army, and Blue Force Tracker. The JMTC, which is the command for the JMSC, Joint Multinational Readiness Center, JMTC Directorate of Training, NCO Academy and U.S. Army Garrison-Grafenwoehr, has individual assets that provide training resources for live, virtual and constructive Soldier-training experiences, all under the direction of a single commander. They can be used as a combined unit or individually. Each unit works with the staff to determine their training needs and how best to optimize it. "Not all Soldiers have rotated through a unit with Blue Force Tracker," said David Pippin, the Battle Command system specialist who manages the Digital University. "It's a fairly new system in the last six years, but they will encounter it in theater. Because it's operator-level training here, they will be able to go to a unit and know the system. It relieves the burden on the squad leaders, platoon sergeants and other section leaders to teach them downrange." The system is critical for operations in theater. It allows for friendly force identification, communications and situational awareness inside vehicles such as a Humvee or a Stryker. When Soldiers receive the training before deployment, they don't spend time in theater accomplishing something that could be done ahead of time in garrison, said Pippin. Digital University provides both individual and collective training for deploying units and replacement Soldiers headed downrange. It also helps train Soldiers for pre-deployment mission rehearsals, command post exercises and NATO exercises. The school provides an inexpensive and conveniently located solution for commanders to ensure their Soldiers stay current on important tactical systems. "We support the unit's training sustainment," Pippin said. "If Soldiers don't continually use a system, they forget it. Just like if you do a difficult task in Microsoft Office once a year, you may forget how you did it and you will need to do it again. The more often you do it, the fresher it stays in your mind." One unique aspect of Digital University is its proximity to other JMTC assets. That proximity allows assets like the Digital University to be shared across a wider spectrum of Soldiers. Recently, the school was offered as an asset to the Noncommissioned Officer Academy at Grafenwoehr. "That's one of those unique things - the NCO academy, the JMSC - all under one commander," Pippin said. "We can reach out and touch that academy and say we have these assets over here that will help you and help our Soldiers. If we weren't under one commander that would be more difficult."